This is the time of the year that most Apple users wait for, new upgrades and apps are released at WWDC every year by Apple. WWDC 2012 starts from today and there are few things which can be expected to be unveiled by Apple for its users and developers. We are listing the 5 things which may be made public at this years WWDC. Apple users have been waiting for this announcement from very long and it is confirmed that Apple will be unveiling their next mobile operating system at WWDC 2012. While there is not much info about the features of iOS 6 but we can expect deeper integration of various social networks like Facebook and Twitter. iOS 6 will certainly have some new kick off features but all be known only when Apple releases it at worldwide developers conference. There has been talks about Apple working on its own mapping application and that it will soon release it to challenge the position of Google Maps. The company may release their new mapping application with the iOS 6. Apple has been keen on replacing Google Maps which is currently the default mapping application for Apple mobile devices. We can also expect 3D view of maps for some places initially which will be somewhat similar to Google's Street View. We can see the voice recognizing interface Siri coming to the new iPad at WWDC 2012. The quite known feature of iPhone 4S will finally be making to the new iPad but there is a sad news for iPad 2 users because it wont be coming to the previous version of the tablet. It is being believed that Siri will come out of its beta version and will be more efficient in responding to your questions. Apple had announced the Mountain Lion OS for their Mac range of computers in February this year. The Mountain Lion OS will bridge the gap between the Macs and iOS. As a result of that, we can see many of the apps for iOS coming to Macs. And the news has been floating on the internet that Apple may launch their new OS i.e., Mountain Lion at WWDC 2012 for their new range of Mac computers. The new MacBook Pro's are lined up for release at this year's WWDC. The new MacBook Pro's are believed to be slimmer and more powerful than its preceders. There is nothing official yet but if rumors are to be believed than the new MacBook Pro's will weight 4.7 pounds compared to the current 5.6 pounds. This makes it thin and quite lighter. It is also expected to get the new Ivy Bridge CPU's from Intel. 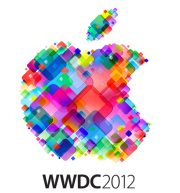 Rest of the things will be confirmed as the WWDC 2012 starts tonight around 10 pm India time. So these were the five things which can be expected to be released at this years WWDC by Apple. We will continue to bring the live updates from WWDC 2012, Subscribe to the blog now to receive all the updates regarding WWDC 2012 in your mailbox.